The two questions heard most often these days are “what is a public charter school” and “when will they open in Alabama”? The answer to the first question requires a bit of detail. The answer to the second question, according to those in the know, is very simple: not this school year. And probably not next school year, either. To be clear, this is not an exhaustive look at charter schools. Rather, it is a small dose of information to better familiarize you with charter schools. Alabama is late to the charter school world. The first charter schools opened in Minnesota in 1992, nearly a quarter of a century ago. The first mention of charter schools I could find in The Birmingham News‘ archives was 1996. All efforts to bring charter schools to Alabama failed until this year when the Alabama legislature passed the Alabama School Choice and Student Opportunity Act, largely along party lines, with two of 26 Senate Republicans and 11 of 72 House Republicans voting no to the charter schools. The bill passed the Senate with a vote of 24-11 and the House with a vote of 58-41. Governor Bentley made it official on March 19, 2015. Since that time, the Alabama Public Charter School Commission (the “Commission”) was appointed, and the Alabama State Department of Education (ALSDE) passed a brief set of emergency rules to get the ball rolling to hash out whatever guidelines were left unwritten in the 66-page law. 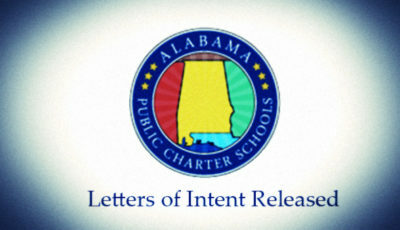 The Alabama Coalition for Public Charter Schools has published a page about Alabama’s law, giving a good overview of what the law lays out for charter schools to operate in Alabama. Boards of education across Alabama are now determining whether they will choose to be a charter authorizer or whether they want to leave that authority with the Commission. That deadline is September 1, 2015. Alabama Association of School Boards Executive Director Sally Howell told school board members attending the summer conference that she expects no startup charter schools to open until the 2017-2018 school year, granting there may be a small chance that a conversion charter could open by the 2016-2017 school year. That gives Alabama’s education community a likely two years before we see the first charter school open. That’s plenty of time to learn the facts. This is what folks really seem to want to know. First and foremost, remember that a public charter school is a public school. The “charter” in charter schools refers to the contract delineating the charter school operator’s plan for serving students who enroll. Charter schools can focus on a particular area of study or on serving a particular type of student. The details are carefully delineated in the charter. 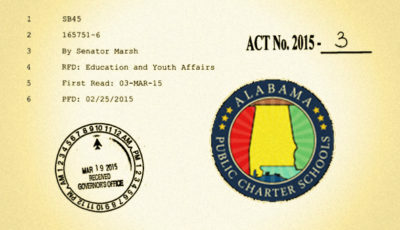 There are two types of charter schools authorized to operate in Alabama: startup and conversion. Conversion charter schools can only be authorized by the local board of education. Unlike magnet schools, charter schools cannot have admission requirements, as in pre-tests or other performance standards. All students are eligible to enroll, space permitting. In the event that there are more applicants than there are seats, students will be selected based on a random lottery, held in plain view of the public. 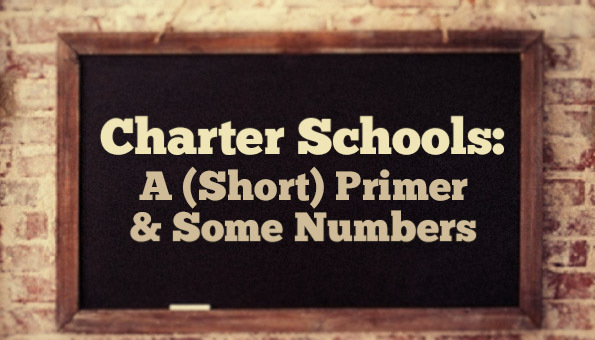 Charter schools are typically granted more flexibility than non-charter schools. This flexibility allows charter operators to operate under different rules than traditional public schools. That flexibility is spelled out clearly in the law authorizing charter schools. Charter school operators complete extensive applications to operate a charter school within a school district. The charter authorizer decides whether to grant the charter operator a license based on the application. The charter authorizer can be either the local board of education or the Commission. Once approved, charter operators will be granted an initial license to operate a charter school for five years. 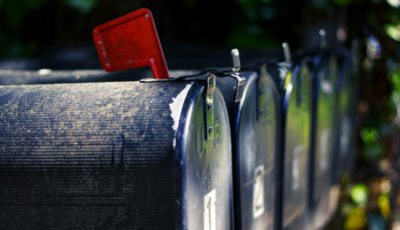 The charter operator must apply for renewal, accompanied by evidence of performance as outlined in the initial charter/contract to have their charter renewed. Funding will depend upon whether the charter school operates as an independent authority or whether the charter school is a part of the school district. Conversion charters will be funded as all other schools in the district. Startups will have a cap on the amount of local funds made available, but will receive all state and federal funds other schools receive. That’s enough operational detail for the moment. Now let’s take a look at numbers. The National Alliance for Public Charter Schools (NAPCS) has developed a dashboard of indicators for public charter schools across the country. It’s worth a look. There are academic performance indicators along with descriptive characteristics about who attends public charter schools. Here’s an infographic put together from various sources, including the NAPCS dashboard. Do Students Perform Better in Charter Schools? Early research showed charter school students overall perform much better than their counterparts in traditional public schools. Charter opponents often cite the 2009 Stanford CREDO study, which did not paint a favorable picture of charter school student outcomes. The National Charter School Resource Center published an analysis of various studies in May 2015. The 2013 CREDO study was not included as one of the studies. The authors determined the following statistically significant findings when comparing the outcomes of students enrolled in charter schools with those enrolled in non-charter schools, noting the small number of studies that have disaggregated student outcomes based on race, and suggest more studies in the future. Both concluded that charter schools did not produce better outcomes for white students. There has been a good deal of proof that charter schools do not serve students with disabilities well. Most studies acknowledge this, and evidence points to students with disabilities being served better in schools that focus on challenges surrounding a particular disability than in a charter school not specializing in serving students with a particular disability. Numbers showing the percentage of students with disabilities served by charter schools are generally unhelpful, as looking at percentages served doesn’t say much about how well those students are served, only that a percentage of students are enrolled. Among Alabama’s school districts, the percentage of students identified with disabilities ranges from 5.8% to 17.9%. The Alabama average is 11.07%. What is important is to know that children with special needs must be allowed to enroll and must be served by public charter schools, just as they are served by non-charter public schools. Even charter schools with a specialized focus cannot deny a student the opportunity to enroll based on any performance- or standards-based testing. Again, the only problem a child with special needs should encounter is a lack of space. If that is the case, all enrollment would then be subject to a random lottery drawing, which would include children with special needs. Receiving proper services at the public charter school may be challenging, but that is already true of existing public schools. There are links in the Resources section below for parents of children with special needs. Dr. Alan Coverstone, Executive Officer for Charter Schools for the Metropolitan Nashville Public Schools, speaking at the AASB conference, shared a number of lessons learned in Nashville with respect to charter schools. He noted that as with any education reform effort, there will be examples of good charter schools and of bad charter schools. Coverstone stated that Nashville’s public charter schools were some of the best performing in the district. The 2013 CREDO study found that Tennessee’s charter schools students gained the equivalent of an additional 86 days of learning in reading and 72 days in mathematics in comparison to students in comparable traditional public schools. Tennessee’s results were among the highest in the study. According to Coverstone, the key to having high-performing charter schools is ensuring that authorizers develop a strategic vision for the best way to use charter schools to improve student achievement, maintain a good handle on how students are performing, and work to replicate good practices, while closing charter schools that don’t produce good outcomes for students. That sounds like good advice for board members of all public schools. To repeat: this is by no means an exhaustive look at public charter schools. But it is a start. Pinterest, Alabama School Connection, “Public Charter Schools”. The 2013 Stanford CREDO Study. The Survey of America’s Charter Schools, 2014. The Center for Education Reform. Table 216.30. Number and percentage distribution of public elementary and secondary students and schools, by traditional or charter school status and selected characteristics: Selected years, 1999-2000 through 2012-13. Charter Schools in Perspective: Key Facts About Charter Schools, In Perspective, Spencer Foundation and Public Agenda. The Facts on Charter Schools and Students with Disabilities, May 2013. Center for Parent Information and Resources. Charter School Enrollment, National Center for Education Statistics, April 2015. Fast Facts, Charter Schools, National Center for Education Statistics, 2015. Special Education in Charter Schools, What We’ve Learned and What We Still Need to Know, Center for Reinventing Public Education, December 2014. Equity at Scale: How Public Charter School Networks Can Innovate and Improve Services for Students with Disabilities, National Center for Public Education in Charter Schools, January 2015. Student Achievement in Charter Schools, What the Research Shows, National Charter School Resource Center, May 2015. What Can Board Members Discuss Outside of a Public Meeting? 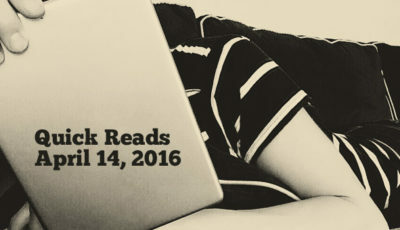 Thanks for putting this article together for us. I love the infograph! Super work!